Re: PKGS -- Packages Ltd.
ye directors pagal hogae hain kia?? Yeh selling kon kar raha hai?. Kia foreigners se selling karwai ja rahi hai ya koi aur hai jis ki selling khat am nai ho rahi. Agar Syed Babar Ali Itni buying kar raha hai to ho sakta hai koi plans hon unke future investment or projects k liye. Like directors do before making any news in public. Bhai, gorry ke selling be tu khtm nae hote iss share mei, directors are buying because they don't want pkgs share to go some other hands. I just saw Almeezan FMR today "https://www.almeezangroup.com/download/fund-managers-report/fund_manager_report_2018/FMR_October_2018.pdf"
They were holding PKGS from quite some time around 5%, now it is not mentioned in top 10 holdings. NIT has also reduced their holdings from 3% to 2%. I am holding since its value was 680 PKR, after averaging my cost is 530 PKR. I was confident because of their high book value, earnings, low debt, investments outside pakistan and the fact that big funds are holding it. 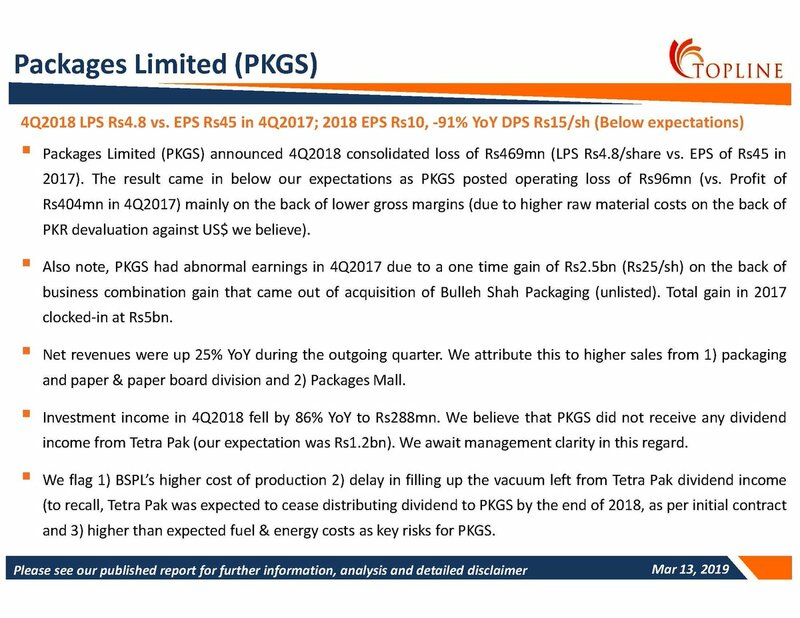 PKGS seems attractive at current levels...obviously the reason for the downfall is declining earnings due to consolidation of bullehshad accounts into the group plus from now on company will not be receiving div. income from tri pack. But on the other hand, groups investments are around 560/sh and trading at P/B of 0.55 atm. Worst Case it can go to 270/sh on technical grounds. Packages mall and Bulle shah has destroyed the consolidated earnings. Plus the income from IGI is also problematic. If there isn't much in this stock then whats the reason of agressive buying by the directors. Are they reducing the free float? Whats its bottom and fair value. Any calculations?